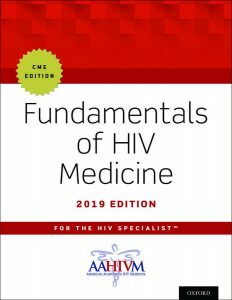 The 2019 Edition of Fundamentals of HIV Medicine is currently in production with Oxford University. The new edition, with upwards of 30 AMA PRA Category 1 Credits and 30+ ACPE contact hours, will be released May 1, 2019. Published by the American Academy of HIV Medicine, this comprehensive clinical care publication for the treatment of HIV/AIDS offers the most up-to-date overview of the latest HIV treatments and guidelines. Fundamentals of HIV Medicine is authored by more than 50 expert clinicians in immunology, HIV epidemiology, gerontology, substance abuse treatment, infectious disease medicine, and other fields central to its medical management, and includes online access to CME. Along with updates to the classic domains of HIV medicine, this new edition features expanded coverage of emerging topics, including: behavioral and therapeutic interventions for HIV prevention; updates on the pursuit of a cure; new DHHS and IAS guidelines and their clinical implications; and the myriad issues around aging with HIV. If you are an active AAHIVM member, email communications@aahivm.org for your 30% discount code!